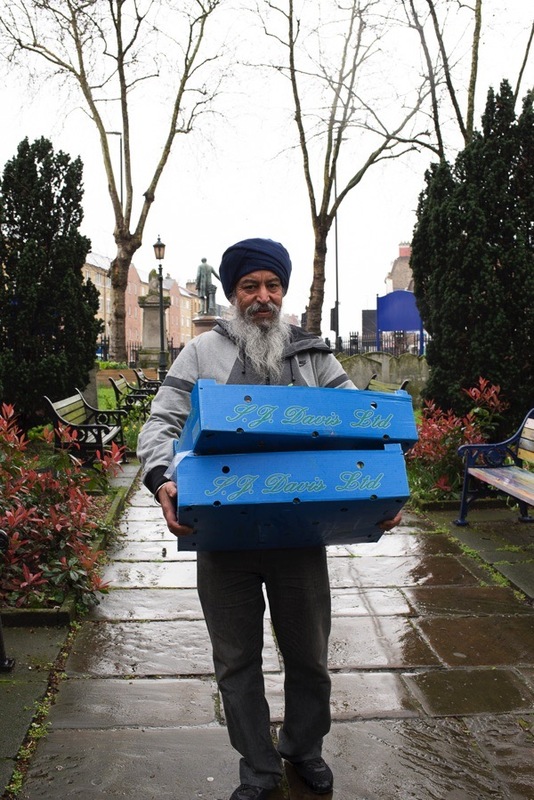 When Contributing Photographer Sarah Ainslie & I visited Bow Food Bank last year, we were delighted to make the acquaintance of Jagmohan Bhakar who organises the supply of fresh fruit and vegetables donated each week by the Gurdwara in Campbell Rd. Jagmohan gets up before dawn each Monday to go the New Spitalfields Market in Leyton so that the food bank can offer the freshest produce. Just a couple of weeks later, we encountered Jagmohan again. 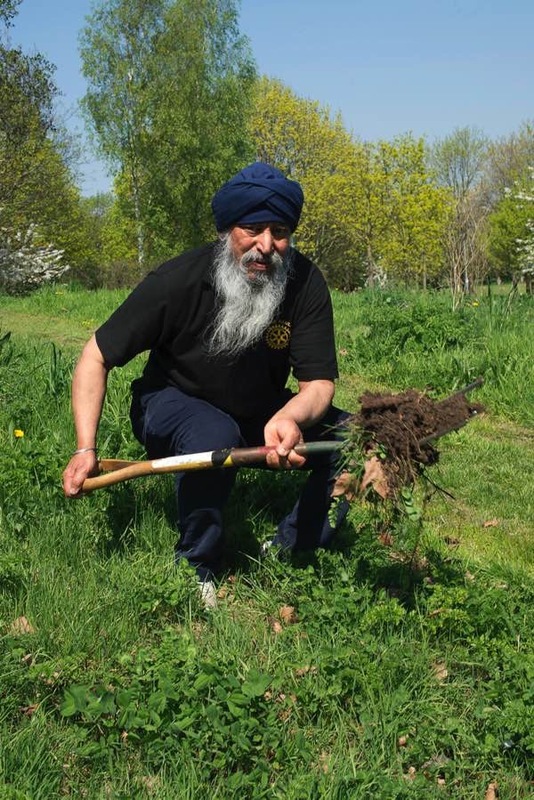 This time he was planting trees in Mile End Park on behalf of Tower Hamlets Rotary Club of which he is a keen member. So I asked Jagmohan if we might interview him and he kindly invited us both around for masala tea and prashad at his house in Bow. When Jagmohan was late because he had been distributing complimentary bottles of water to runners in the City of London marathon, we realised that a certain pattern of behaviour was emerging. 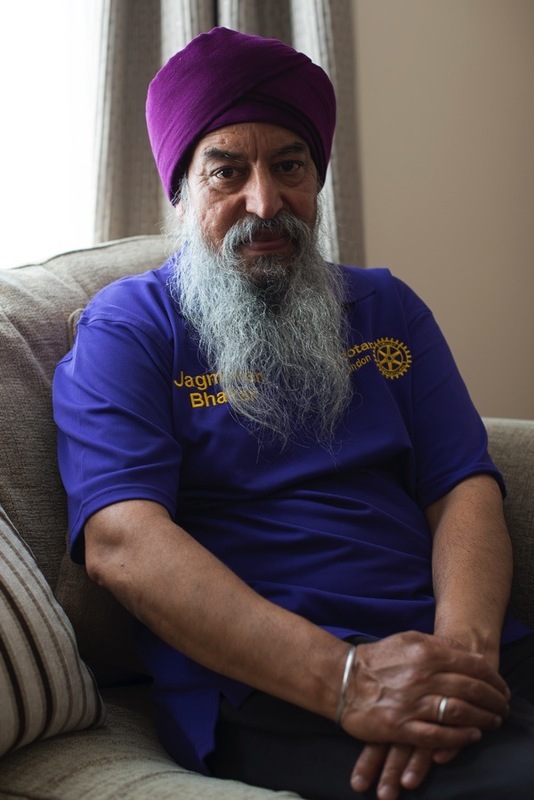 In becoming a Rotarian, Jagmohan has found the ideal vehicle to permit him the expression of his sense of generosity and service to others which is central to his Sikhism. “I was born in Ambala in India and came here in 1967, when my father Dehal Singh Bhakar called my mother and me, my brother and two sisters to join him here. Since then I have lived in London. It was exciting to move to another world and be reunited with your family. My dad came in 1948 and it was quite some time since we had seen him. I was twelve years old and pleased to be with my family, I struggled to learn English. It was a new life of new experiences. When my father came, he and some others worked as pedlars around Euston. They purchased textile goods near Liverpool St Station where there were Asian suppliers and sold them in different areas to make a living. At first he lived around Aldgate and Brick Lane, but by the time we arrived he was were living in 10 Piggott St in Limehouse. It was a big family home and a centre for many of our relatives, when they came to London it was their first stop. We all used to get together, and everybody loved seeing each other and going to each others’ houses. School was difficult at that time in the sixties. I had a little bit of a language problem and also a difficulty in making any friends who were other peoples. It was a new experience. It was challenging, especially in the seventies after Enoch Powell made his speech. He was a bloody one. It was a sad time. People were very concerned. We were thinking of going back home. Some people left and came back later. Times were tough. At that time, many people from our community lived in Tower Hamlets in East London but because of the issues they started moving further out to Forest Gate and Manor Park. That was the reason they moved from Tower Hamlets to Newham. I went to Langdon Park School in Poplar, there were only a few other pupils who were Sikhs. It was not bad. I am quiet by nature so I do not have many friends anyway. I had good days and bad days. We had no alternative because we had decided to make this our homeland, so we could not have second thoughts. Sometimes I had problems, walking down the road, there might be some abuse. I was beaten up a few times. Over the years, things have changed. When I was seventeen years old, I left school and went to college. I studied Engineering but after that I could not find a job. Perhaps the course I had taken was too theoretical? I wanted a job in industry but they asked if I had any practical experience, which I did not. Times were hard. There were not many apprenticeships. I did some odd jobs. My father was doing a little bit of business to keep himself, so I joined him after that, working in property lettings. Even the lettings were not that good at that time but we survived. I used to do the running around while he took the more relaxed role. It was not big business, just looking after the family really. But slowly things improved and it made life a little more comfortable. Today, me and my brother manage lettings for a few properties that my father left. We are doing much the same thing he did. We are a very big family because my father had seven brothers and one sister. He was the youngest of his brothers. Obviously, they could not all stay in that house in Limehouse where my father lived with two of my uncles. Members of the family only stayed there until they could organise something for themselves. A year after we arrived in London, my father moved us here to Lyal Rd off Roman Rd where I still live today. I remember my brother buying toys from Gary Arber’s shop. 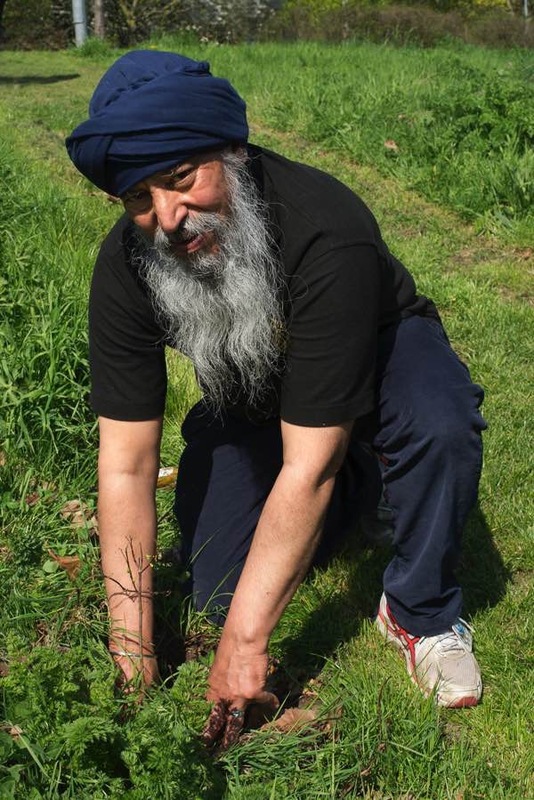 Yes – the world would be a better place if we all followed the caring Sikh way of life. The world needs more Jagmohan Bhakars. Yes i agree what a lovely man he is a credit to his religion and this country. Yes. What a lovely sounding chap. Good luck to you sir. I am glad to see this item about Jagmohan. His father was a firm friend of mine for many years. He would be proud to see the decent man that his son has grown to be. I totally agree with my fellow commenters, what a thoroughly decent human being. It sounds like Jagmohan has every excuse to be bitter and biased, considering some of the unpleasant and racist experiences he has had in London. But he has chosen a different path and for that, and his clear generosity, I totally commend him. We need more people like this, people who don’t just take, take, take, but those who decide to give back. I wish him every success and happiness in this life and what lays beyond. A post full of humanity. Good to read about a kind man, who has overcome racism and rejection and makes it his business to help others. Life affirming stuff. An inspirational story of kindness and despite facing some obstacles along the way…..Jagmohan is a shining example of the resilience of the human spirit. A lovely post today…thank you. This is inspiring Jagmohan, well done.